I don’t know who wrote this, but it’s hilarious! UPDATE: I do know who wrote this, NW Jew, see comment below… it’s still hilarious! No need to worry, however. Our team of spiritual healers have devised a cure and we are making it available to you exclusively today. Please pass it on to anyone you know who may be suffering in silence. “Shul Rules” is your ten step guide to synagogue confidence. If you arrive after the start, don’t sit down right away, but instead open the book near the beginning and spend 2 or 3 minutes turning slowly through the pages while mumbling under your breath. If you recognize any of the Hebrew words, say one or two of them a little louder so those around you can hear. Find a seat just behind someone who looks like they know what’s going on (you can tell this person because they are likely to be mumbling to themselves under their breath). Make sure this person is using the same prayer book as you. Keep a note of what page they are on by glancing casually over their shoulder every now and again. A pair of strong magnification glasses may help here. When putting on the tallit, wrap it around your head for a few seconds while mumbling under your breath. Liberally sprinkle your time in shul with more barely audible mumbles as you look intently at the pages of your siddur. Again, the odd word, phrase, or line spoken accurately and a little louder than the rest goes down very well. Don’t jump up whenever the person in front does. He may be stretching his legs. Instead, wait a moment until a significant proportion of the congregation is standing. In this way, even if they are all stretching their legs, you won’t look conspicuous. See those guys near the front that are wandering around with an air of assurance? These are the members of the service committee. AVOID EYE CONTACT WITH THESE PEOPLE or you may find yourself being asked to do something strange, like opening the doors of the Aron Kodesh or, heaven forbid, saying something in Hebrew out loud to everyone. Schockelling is an entire lesson in itself but there are two basic forms. The “lateral swing” is usually seen in ultra-orthodox congregations. Here the practitioner is perfectly still from the waist down (feet together, naturally), while the top half of the body repeatedly twists at a steady speed. The “hammerhead” is more prevalent in mainstream orthodox shuls and, as the name suggests, the congregants look as if they are trying to bang a nail into the floor with their heads (I say “his” because women prefer to use this time for kibitzing or kvelling over the way their grandsons shockel). Shockelling mainly takes place during the silent Amidah. This is about 10 pages during which you have no idea where everyone else is. All you do know is that if the others were really reading all the prayers involved, they would be contenders for the world speed-reading record. You know when it starts because everyone puts their feet together, dip at the knees, and bows. This is your cue to start shockelling while turning the pages of your prayer book approximately every 15 seconds. The end of the silent Amidah is signaled by everyone taking three short steps back, bowing to the left, the right and the centre and then looking round to see if they won. 7. Is the Rabbi speaking in English and yet you can’t understand what he’s going on about? If so, this is the sermon and it’s your job to look alive. Paying attention to the sermon is a skill that may take many years to master rather in the way that one learns how to complete diagramless crosswords. 8. Feel free to talk to people near you at any time. Business and football are particularly appropriate topics of conversation. Seeking kavanah and listening to the sermon will be regarded with suspicion in most communities. 10. If you can keep your cool until the end of the service, you will be rewarded. At last something that is familiar, and a chance to clear your throat and give it some as you bash out Ein Kelohaynu and Adon Olam, just like you did at cheder all those years ago. One final word of warning. If it goes well and you feel confident enough to go back for a second week running, you will be classified as a regular. This means there is a very good chance you will be asked to be the next synagogue president. When considering this essay, I figured a rabbi should have religious places that hold special if not sacred value, so I thought of the synagogue of my childhood where I learned (or at least they tried to teach me) the rich traditions of Judaism. I thought of the shul where I davened (prayed) with my grandfather. I thought of the synagogues I have been privileged to serve. I thought of the myriad places in Israel that have historical and religious significance to Jews. And I thought of the synagogue where my children became bar and bat mitzvah. And while all these places brought fond memories, none felt inspiring. I panicked. How could I write an essay on inspiring places when, while important and meaningful, none jumped out as truly inspiring? Then I realized all had a common trait that was inspiring—people. It wasn’t the synagogue of my childhood that was inspiring; it was Mr. Shapiro who taught me that learning Torah could move me to be a better person. It wasn’t davening in my grandfather’s shul that was inspiring; it was seeing my grandfather’s non-judgmental piety, in the face of so much personal tragedy, that inspired me. It wasn’t leading a congregation that inspired me; it was the privilege of being with people as they experienced the ups and downs of their lives that inspired me. It isn’t the synagogue where my children became full members of the Jewish community that is inspiring, it is their acceptance of their place in the community and the love of friends and family that inspired me. Jewish tradition holds that there are only two things holy in a synagogue—the Torah and the people. The building, while important, is just a building. 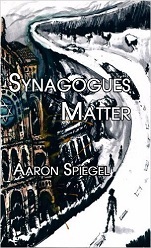 Crossing the threshold into the synagogue does not take one from the world of the profane into the world of the sacred any more than crossing the threshold of an office building. What’s really important are the people whom we seek to inspire and who, in turn, will inspire us. When the second Temple was destroyed in 79 ACE, the community faced a conundrum. How could they maintain a sense of Judaism without this thing, this structure, as the central focus of their faith? In their inimitable wisdom, the rabbis transferred the power of the Beit Hamikdash, house of sanctuary or holiness, to the home—the Mikdash Me’at or little temple. Parents became the new priests and children their charges. While synagogues became and remain important, they are so primarily because they offer a place to congregate, to be together as a community. In his book Shopping Malls and Other Sacred Places, Lutheran theologian Jon Pahl writes that new institutions have usurped churches, synagogues, temples, and mosques as our revered spaces. For me as a Jew, it’s not that these places compete with synagogues for our souls; it’s that we have forgotten how to be in community. Instead of seeking inspiration from one another, we search for it in experiences. Life has taught me that the experience of inspiration is not found merely in congregating with others, but in forming relationships. Martin Buber was clear that it is when we acknowledge the humanity of others in our relationships that we experience God. Judaism says that it is loyalty to the teachings of the Torah that is the measure of the faith of the Jew, and not loyalty to an institution. Jewish spirituality centers on being inspired by others. Which is better: the focus on finding the spiritual in the synagogue or in life’s journey? I am not convinced that either is better, but that personal spiritual growth requires both. It is our tradition to explore the Divine in places other than the synagogue, especially in the home. The concept of Mikdash Me’at, the sanctuary of home, is a cornerstone of Jewish spiritual practice. However, it is also our tradition that prayer in a group is more powerful than alone. It is not happenstance that a quorum, minyan, is required to recite certain prayers, particularly those that are most personal. It is not that God hears better in groups, it is that we hear better in groups! Our connection to God is through our connection to each other. Therefore, the synagogue provides the space where the sacred can congregate, where people can come together with Torah and live the experience of Judaism. After all, what are we worshiping? It’s not the building, the chairs, the walls, or the aron ha’kodesh; we are worshiping our aliveness and our connection with the Divine. Buber also said, “Next to being the children of God our greatest privilege is being the brothers of each other.” That inspires me! Congregation Beth-Israel has just finished a successful fundraising campaign. The campaign’s purpose was to purchase playground equipment for the children of residents of a local battered woman’s shelter – a great cause and an example of tikkun olam in action. Not only did Beth-Israel raise enough money to purchase the equipment and its installation, they raised enough to set aside a fund for future maintenance of the playground. The campaign was a success. The major players in this campaign were four active members – Ruthie, Arlene, Joan and Lizzie. All four women are active sisterhood members. Arlene is chair of the social action committee. They all worked tirelessly for nine months planning and executing this project, often meeting several times a week at the synagogue. The local newspaper writes an article about the new playground noting that the funds were raised entirely through the efforts of Congregation Beth-Israel. The article did not mention by name any of the four women, though the rabbi acknowledged that it was a congregational effort. This is okay for Ruthie, Arlene, Joan and Lizzie. They do this work because that’s what tzedakah is about, seeking justice anonymously without expectation of personal gain. The synagogue proudly posts the article in the entrance foyer with a poster-sized sign saying, “Thanks to all our members who participated in this effort.” The project and newspaper article were the topic of the rabbis newsletter feature for the following month. Again, no one is cited or thanked by name and again, the group members say nothing. Several months later the city officials ask the rabbi to help plan a citywide, interfaith event renaming a downtown park after a famous local philanthropist. Arlene happened to be in the synagogue office the day after the rabbi agreed to participate in this event. Since she did such a magnificent job with the playground project, the rabbi asked if she would chair this event. He also suggested that she enlist the support of her former fellow committee members. Of course, Arlene agreed – and, so did Ruthie, Joan and Lizzie. Sound familiar? Synagogues reward successful synagogue volunteers with more opportunities to volunteer. For most volunteers, this cycle lasts a few years until they finally decide, often with personal and private embarrassment, that they can no longer work so hard with so little in return. All they really want is a heartfelt “thank you” and a little recognition for their efforts. Synagogues do not know how to do this and so the cycle repeats itself over and over. People like Ruthie, Arlene, Joan and Lizzie often keep up their service because they innately understand the concept of kol Yisrael arevim ze ba’ze — all the people of Israel are responsible for one another. They also take to heart the notion of tikkun olam — that they are responsible for healing the world. For these women and many other synagogue volunteers, gemilut hasadim are not optional. Acts of loving kindness are requirements of a Jew. And yet our synagogues often fail to practice these same principles. We need to change our pattern of volunteer engagement. Jill Friedman Fixler of JFFixler and Associates, a nationally recognized expert in the field of volunteer engagement says, “Volunteering is not a life sentence!” One of the first steps in changing our pattern is to think of volunteering proactively rather then reactively. Synagogues generally find or agree to the project first without knowing if they have a pool of willing and able workers from whom they can choose. No other business or non-profit functions this way. Why should synagogues? A major step in this proactive model is learning about the skills and talents of synagogue members. The church world has embraced this model using terms like gifts discernment or spiritual gifts inventory. In many of these congregations, every member goes through a process of interviews and training to discern their personal gifts. This often happens with new members when they join the congregation. For some this is an intense process of introspection, deciding what their gifts are and how those might best be used for their congregation. For others it is a simple matter of filling out a form that list their interests or hobbies. The next important and vital step is to record the information in a database that makes the information readily accessible. Here is an example of how the process might work. The synagogue’s teen group is planning a project to clean up a block of one of the city’s neglected neighborhoods. The education director sees this as a great opportunity to recruit new teen group members by recording the teens “in action.” She needs someone to videotape the day and then edit the piece into a promotional and educational video. How would most synagogues handle this project? First, they might solicit someone like one of our congregational stalwarts in the playground scenario. Of course, they would readily agree. While they may own a video camera, the resulting finished video is, shall we say, of questionable quality! The other option often sought is to hire a professional to do the project. The quality is first-rate, but so is the cost. The final scenario, and the one I suggest here, is to consult your database of volunteers (which of course, you have been collecting for the last many years!). With a few short keystrokes you discover that while Joe now works as an attorney, he worked as a videographer for his college television station while he was an undergraduate. He is still an avid amateur video maven and a prime candidate for your project. Joe has never volunteered for anything in the synagogue before but he quickly agrees after receiving a personal phone call from the committee chair. Up until now, no one has asked him to help the synagogue before and he is thrilled to receive this personal invitation. It is clear that this is a time-limited project. He can complete it in a few days. It will not interfere with his hectic work and family schedule. The final product is polished and professional, cost was minimal, and the congregation has enlisted the support of a new volunteer. There are tangible benefits for synagogues with this proactive model. Synagogues can increase member engagement and create a culture of service and involvement. Since the synagogue has ready access to the skills that congregants are willing to give, volunteers are more likely to repeat their service to the congregation. Their initial experience with volunteer service was a great one and they now trust the process. Synagogues need to begin seeing volunteers as gifts to the congregation. Many congregants want to be more active in the life of their synagogue. Some are afraid of setting a precedent – if I volunteer for this project they’ll never stop calling. Others simply do not know how to become more involved and are embarrassed to ask. Successful volunteerism is a proactive venture, not a passive one.